Savvy Spending: Michael's: 50% off any regular price item coupon! 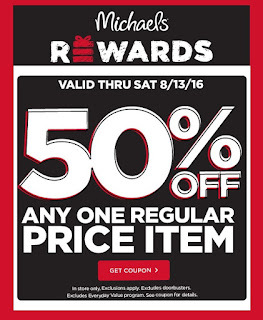 Michael's: 50% off any regular price item coupon! You can save 50% off any regular priced item at Michaels, through tomorrow, 8/13! Just GO HERE to print or have the coupon sent to your mobile phone. Remember, Michael's and JoAnn's will both take each other's coupons, so if you prefer JoAnn's, you can still use this coupon there!